Another Beautiful Day in Paradise. Today was a little foggy and misty with temperatures in the mid 60s and a little breeze. Bladers/Bicyclers Deb D, John L, Pam R, Jeff B, Joel R, Glennis W, Jim & Wilma F, Dorey Anne & Bruce M, Andrew F & Claudia R, Carol J, Linda C, Steve G, Rick P & Ginnie S, Cindy S, Dimitri F, Monica & Kevin K, Rob H and Joel R came. We did basically our Snell Isle/Shore Acres route with a trip by Sandi & Michael's house and Kim & Joel's house. We got Michael to come out and talk to us and we met Kim walking her dog. John L guided us through most of the route. 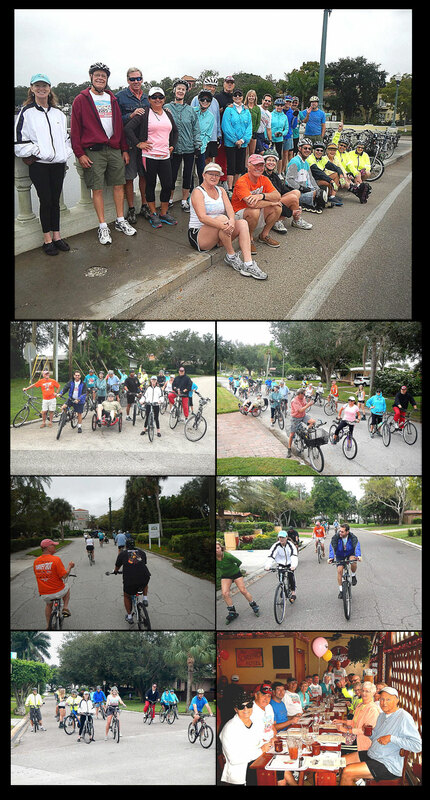 We had 21 Bicyclers and 3 Bladers. Most everyone did the 12.5 miles. This last week Linda M, Tom H, Dimitri F and Laura P renewed their Sponsorships. Thanks Linda, Tom, Dimitri and Laura for the website support. We Brunched at Harvey's as planned. Harvey's was very crowded and if Dimitri hadn't gone ahead and made a reservation for us, we probably would have had to wait a long time to get in. Harvey's was very helpful in getting us seated as we had underestimated how many of us were going to come. Service was good considering and the coffee flowed freely. We gave Harvey's a 9.7.